It started with this picture - though I didn't realise it at the time. This is a picture of me about three weeks after my son was born. I had hoped to have him at home but circumstances were that we needed to transfer to hospital. After a long labour he was eventually born by caesarean. He also had an infection which meant we had quite a lengthy hospital stay, ten days in total. During this time I was trying to recover physically from surgery, coming to grips emotionally with a birth experience which had left me traumatised, finding my way as a new mother and what it meant to have this tiny human dependent on me 24/7 for survival and overcoming the challenges we were experiencing with breastfeeding. Finally after ten days when he was given the all clear, we were sent home from hospital. It was two days before mother's day and I was so happy to finally have my baby home, to be in our own space as a family together and to be celebrating my first mother's day. But I also felt a sense of loss of control. A loss of control over my birth experience, breastfeeding and how it was going, my expectations of life with a new born and life in general. I realise now, in an effort to try to regain some of this control I tried to 'get back to normal' - going to the pub, going to the market, having friends round and entertaining. This photo of me was taken about three weeks after my son was born. I look at this photo now and my heart aches. 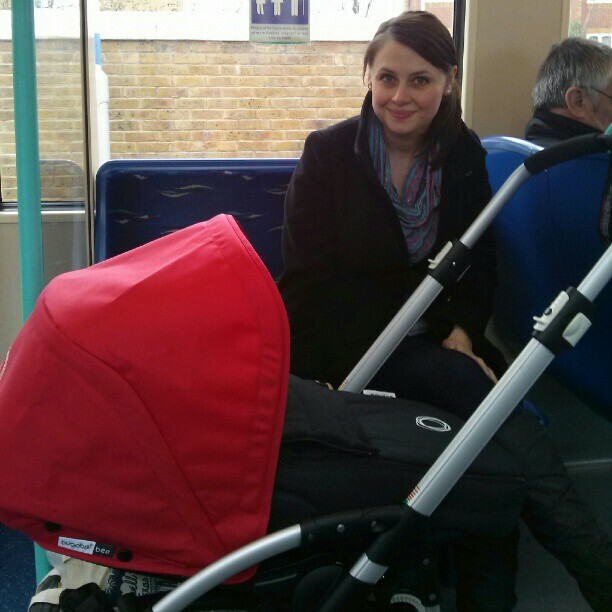 I was on the DLR with family who were visiting from Canada because I felt the need to make sure they were entertained and were having a nice time on their trip. I was three weeks post caesarean. I was sore. I was tired. I was self conscious breastfeeding in public. I look at it now and think WHAT WAS I THINKING?! And why were they letting me do this?! Why weren't they telling me to go back to bed?! I struggled with the trauma that I experienced during birth - I couldn’t talk about my birth experience for years without crying and feeling incredible anger and sadness at what had happened. I probably had post traumatic stress disorder but didn't realise it at the time. My relationship with my partner suffered, I struggled to cope with the lack of sleep and any kind of stress that I experienced. I threw myself into looking after my son because I felt I had let him down in the beginning and wanted to make up for it and the result was that I neglected to look after myself. Fast forward three years and I became pregnant with our now daughter. I had reflected a lot on my previous birth experience and had also experienced the loss and grief that comes with miscarriage. I knew that I wanted to do things differently this time. While pregnant, I came across Heng Ou's amazing book The First Forty Days and it changed me. I started with Ou's book and read everything I could on the postnatal period, other cultures and the customs and rituals they have to support new mothers and the very real difference this can make on a woman as she adjusts to this new life with her baby. I knew I wanted something different this time around. I wanted what I now refer to as a 'mothermoon'. Click here if you want to know more about 'mothermoons' and how I can help you have the start to motherhood that you deserve!